If your front yard needs a new look, and you’re not sure where to start, don’t worry. Landscape renovation doesn’t need to stress you out. Here are a few tips to get you started. 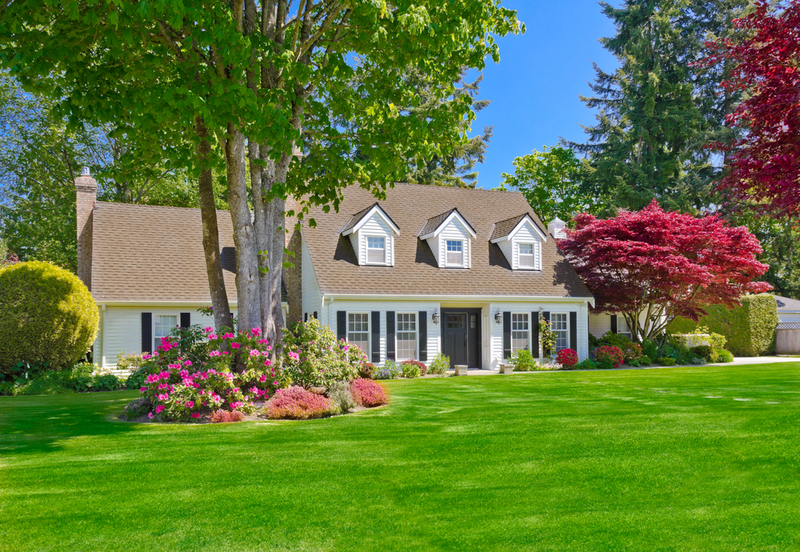 Grass with a nice edge, two or three types of foundation shrubs, well mulched, and a pocket of annual flowers to add seasonal color are all you need for a great look. Maybe add a shade tree for good measure, if space allows. Cutting an underground utility is an inconvenience at a minimum. Avoid costly, and possibly dangerous accidents by placing a call to your local utility locate service a couple of weeks before planting. It’s free! Don’t be fooled by descriptions such as “dwarf” or “slow-growing.” These are relative terms. Although plants never stop growing, and environmental conditions may help or hinder their progress, it is useful to know the “average size at maturity,” which may be listed on the plant label in terms of height and width. If a shrub routinely grows to five or six feet, it may not be the best choice to plant in front of ground-level windows. Conversely, a plant that only reaches 18 inches won’t be visible when planted behind larger shrubs. Long, gently curving borders soften the look of the landscape and add visual interest. Before creating the permanent edge, test the curves with your mower to be sure you can make the curve easily without running over the bed or missing parts of the grass. Our brains look for patterns. Even numbers of plants are easily picked up on and can be distracting when we see the pattern rather than the big picture. When planting a small grouping – fewer than ten – use odd numbers to minimize the effect of this phenomenon. There’s no substitute for good maintenance. A great landscape can easily look bad when weeds take over mulched areas, or plants are overgrown. Allowing the grass to grow too long between cuts can result in discoloration, weed competition or disease. This may be the most important reason for tip #1. The simpler the design, the easier it is to maintain; and the more likely you will be to care for it. There are three ways to add flowers, and each can help with the overall look of your yard when used according to their strengths. Annual flowers live one season and provide lots of color. Plant annuals in consolidated masses such as a pot by the front door or a small garden beside the mailbox. Perennial flowers come back year after year, and mostly have a “color window” of a few weeks. Perennials work well when multiple species are intermingled in patches that bloom in progression through the year – not the best scenario for a simple front yard design, but great for a lived-in part of the yard. Flowering trees and shrubs, like perennials, offer their color in a compressed season, but because of their year-round structure, many are useful as foundation plants, hedges or shade trees. A landscape renovation need not be a major expense. Healthy-but-overgrown foundation plants may be brought under control with dormant pruning in late winter or spring. A neglected lawn may only need a bit of fertilizer and weed control to regain its glory. It can be really amazing to see what can be accomplished by giving your landscape the maintenance that has been lacking.